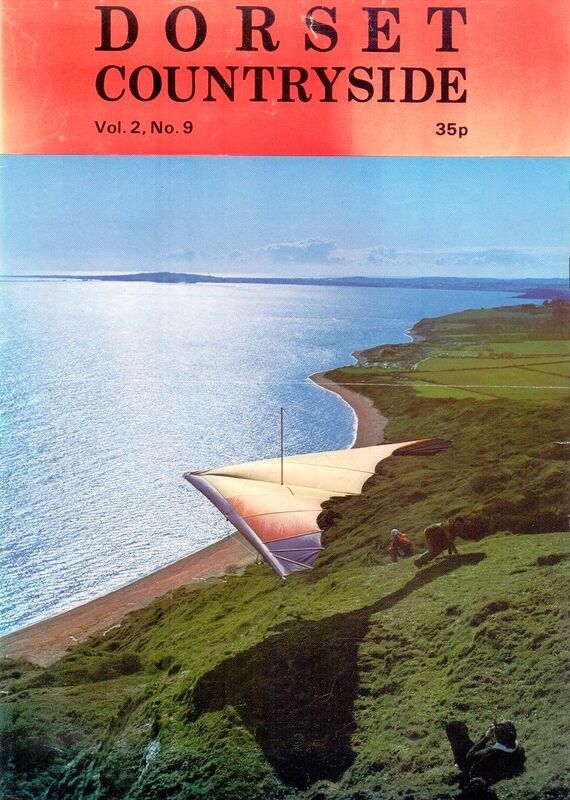 This page follows Hang gliding 1976. The Cirrus 3 of 1976 was manufactured by Scotkites under licence from Electra Flyer of New Mexico. We no longer launch from the cliff top at Ringstead. Instead, we take off from a hill a little way inland and fly out to the cliff. I am told that this part of the slope crumbled away at some point. Reprinted courtesy of Ultralight Flying! magazine. ‘Flap chaps’ (see the translucent triangle of fabric stretched between the pilot’s legs) helped you obtain a steeper glide on your final approach to landing. However, they did nothing to correct the cowboy image of hang gliding in the 1970s. Reprinted courtesy of Ultralight Flying! magazine. 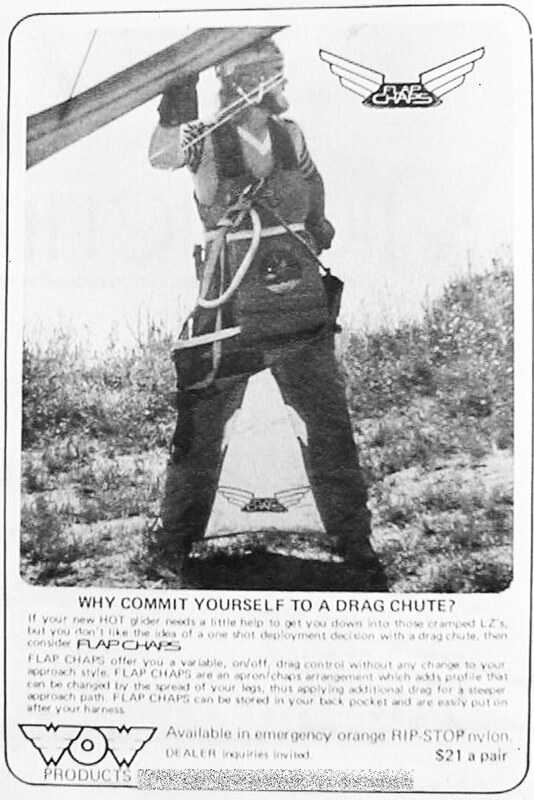 The cover photo by Glider Rider picture editor H. Krause (not to be confused with publisher Tracy H. Knauss) is of Dave Ledford after his wing tumbled seven times following a failed wingover attempt (at Lookout Mountain I think). 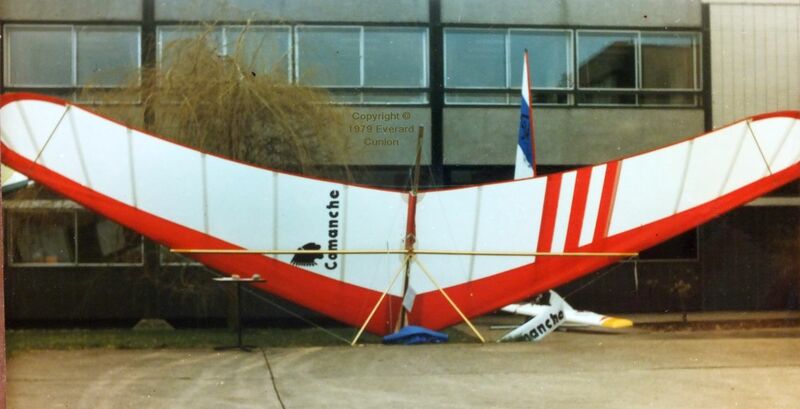 He was unhurt and his glider, a Moyes Mega II (with crosstube fairings, by the look of it) was largely undamaged. Reprinted courtesy of Ultralight Flying! magazine. Ballistically deployed versions of the emergency parachute were developed subsequently and that technology was applied to the emerging phenomenon of powered ultralight aircraft (microlights in UK terminology) and, later, to more conventional light aircraft. 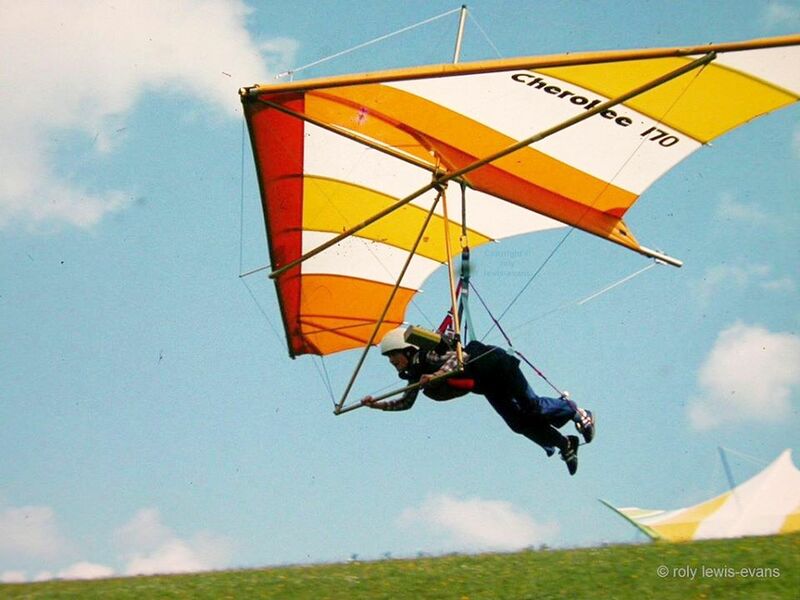 See Dangers of hang gliding for more about hang glider emergency parachutes. 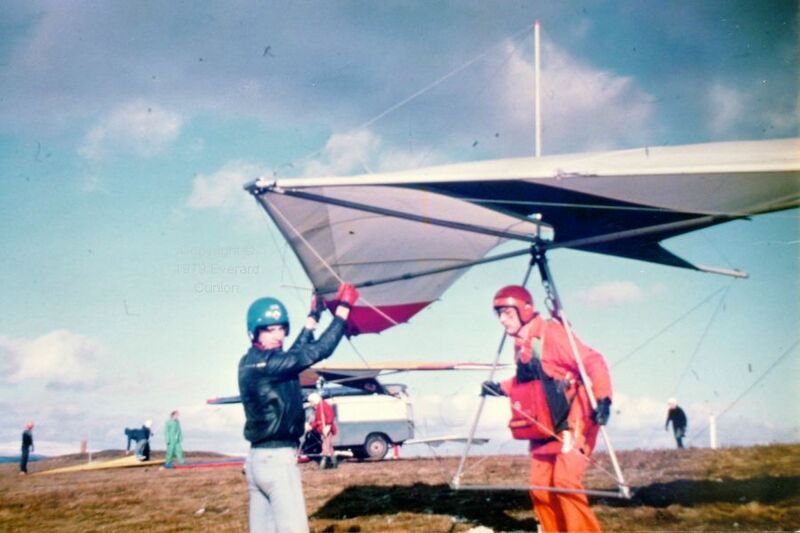 In this photo by Gary Phillips, I am about to launch a Skyhook Sunspot from the Merthyr ridge in February 1979. The glider belonged to the students’ union at the Polytechnic of Wales, where I was studying computing at that time. Flying a Skyhook Sunspot at Merthyr Common, Wales. I was heading home after another PIO-filled weekend, trying my best to visualize just what the glider was doing and what the proper response should be. I somehow figured it out and surprised everybody when the next flight went smoothly. 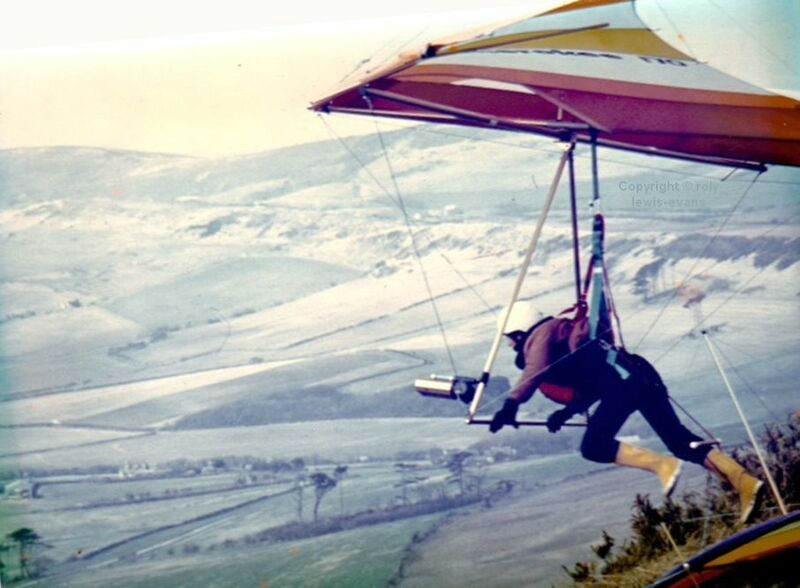 PIO is bad enough, but some later hang gliders required no out-of-synch pilot input to enter the so-called Dutch roll. (If you ever saw the opening sequences of the 1970s television series The Six Million Dollar Man, you have seen a crash caused by Dutch roll.) 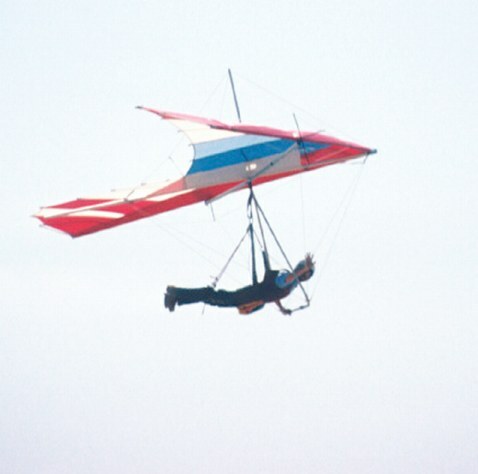 Hang glider pilot and NASA test pilot Mark ‘Forger’ Stucky determined that a high-performance hang glider of 1989 exhibited Dutch roll rather than being merely susceptible to pilot-induced oscillation (like the Skyhook Sunspot). I have forged a link farther down to the magazine containing his article. An Electra Flyer Olympus in 1978. Photo by Mike Adkins. 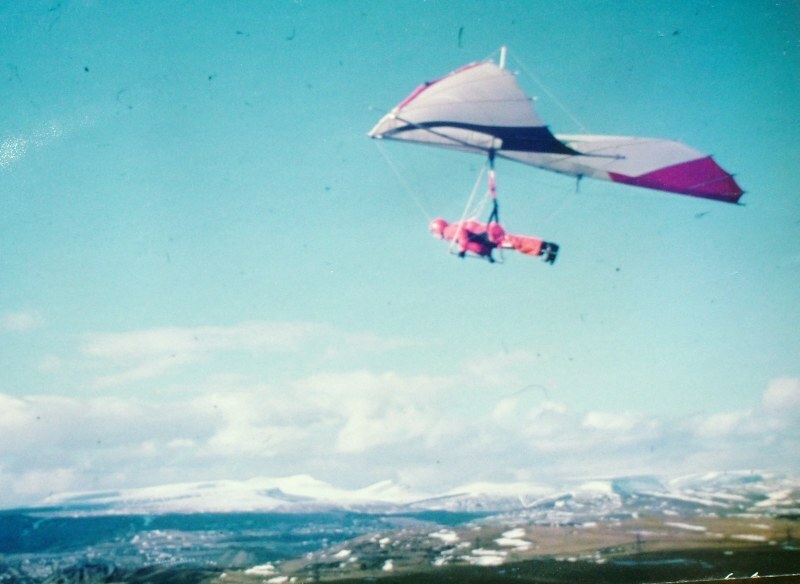 A popular hang glider first produced in 1977 was the Electra Flyer Olympus. You might be able to discern the short struts projecting from the leading edges. They supported cables, above, in front of, and below the wing, to keep those lanky leading edge tubes in shape. 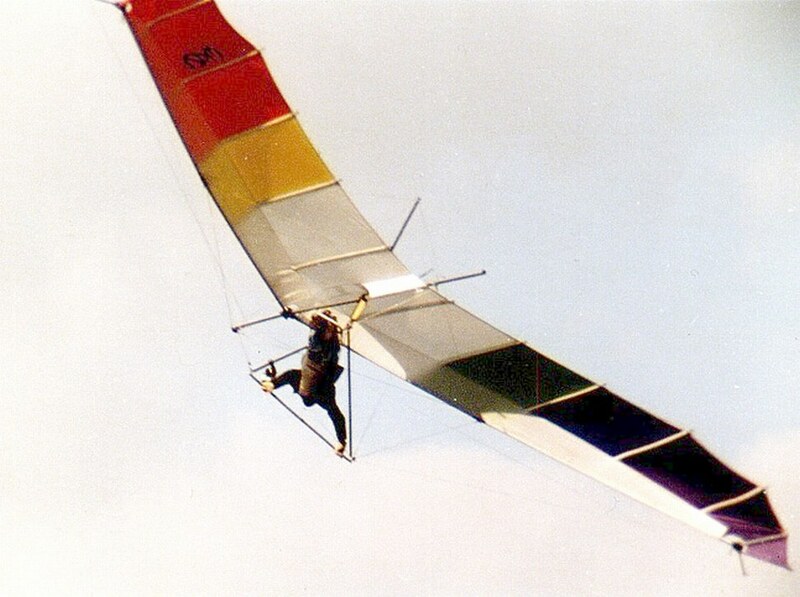 Together with the exposed crosstubes (and the exposed pilot) they created a large amount of drag, which the next steps in hang glider evolution set out to reduce. Mike Adkins took this photo in July 1978 at Plaskett Creek, Los Padres National Forest, on the Pacific Highway south of San Francisco. Mike later took up paragliding and was active both as a pilot and site administrator right up to his death after a short illness in November 2009. 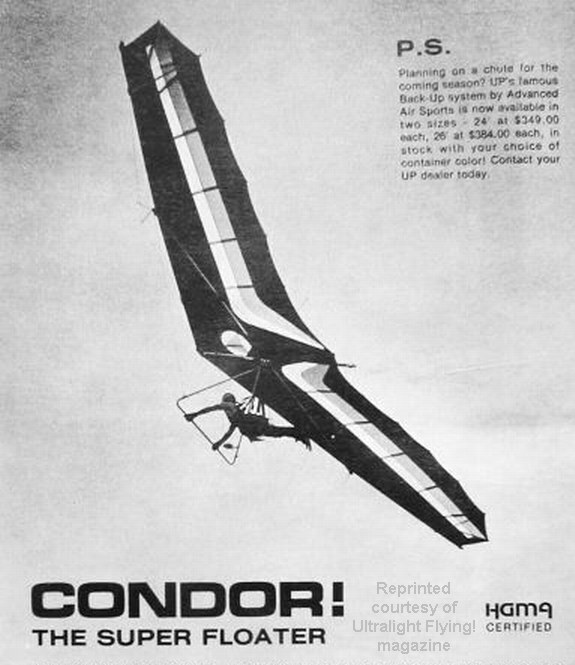 Ultralight Products Condor. Reprinted courtesy of Ultralight Flying! magazine. The Ultralight Products Condor. Reprinted courtesy of Ultralight Flying! magazine. Bob Dear, flying the Miles Wings Gryphon in the photo, says that you had to actively fly the it all the time—you could not relax. It was, however, immensely precise and controllable as well as having unbeatable performance (in its time). Production of the Gryphon was taken over by Waspair in 1978, inventor Miles Handley being unable to keep up with demand. Note the bowsprit and cables instead of crosstubes bracing the leading edges. Unfortunately, all those cables still created a great deal of aerodynamic drag. 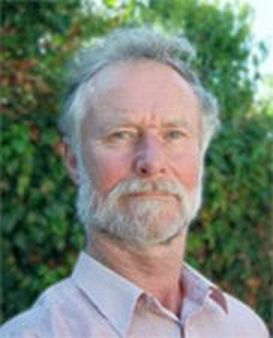 Bob Dear, winner of the Gray Prize for Journalism (named for hang gliding photographer Bettina Gray) led the documentation of hang gliding in this region of Britain for many years. 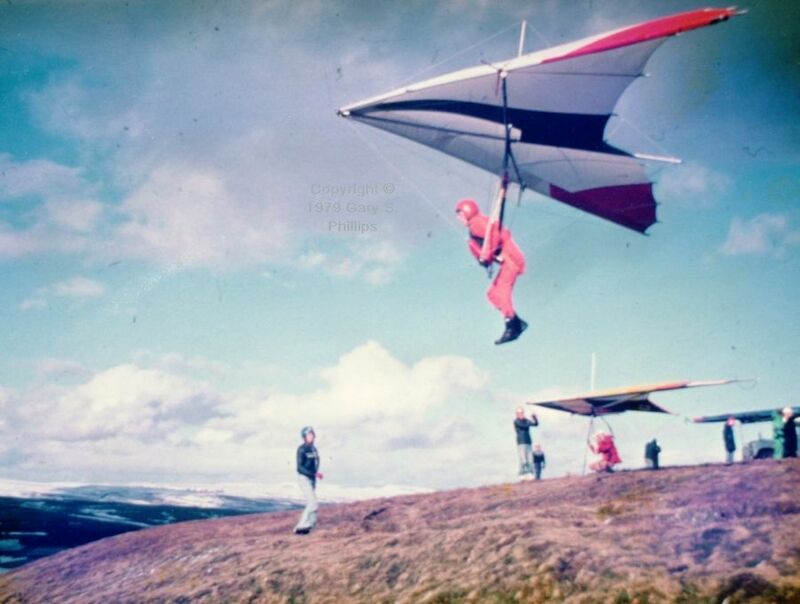 Roly made the sails for my experimental hang gliders in 1975 and ’76. He then became a full time sail-maker for a succession of leading hang glider manufacturers, including Birdman, based in Wiltshire, UK, who made the Cherokee. A manufacturer in the USA (Electra Flyer of New Mexico, I think) discovered by accident that their novice level glider without deflexor wires bracing the leading edges outperformed their more advanced wings. Realizing that deflexors caused too much drag, hang glider manufacturers then changed to stronger leading edge tubes instead. In Britain, the Hiway Superscorpion (said to be based on the Australian Moyes Maxi) was the most popular of that generation of deflexorless wings. Birdman of Wiltshire took a different approach with their Cherokee in that it retained a single deflexor wire in line with the airflow. Its drag was reckoned to be minimal and it facilitated tuning the wing as a whole (tensioning or de-tensioning both sides together using turnbuckles) and you could tune out a turn if one developed by tensioning or de-tensioning just one side. Incidentally, although it might look as though he used the flat-rigged hang glider as a launch trampoline, I am sure that is an optical illusion! The Comanche was, as far as I know, the last Birdman hang glider. Solar Wings had by then started in direct competition with Birdman. I photographed this one at the BHGA annual general meeting held at Warwick University in about March of 1979. 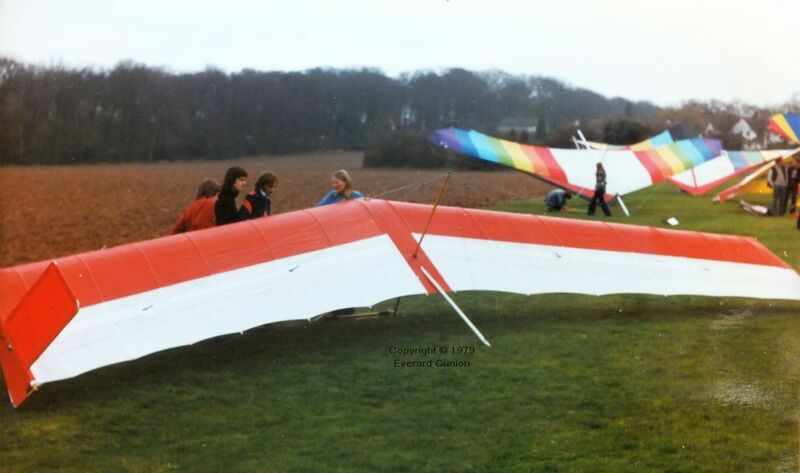 The Manta Fledge 2, here at the 1979 BHGA AGM, was an update of an early 1970s ‘semi rigid’; a rigid hang glider made of the same materials as flexwings: Sailcloth, alloy tubing, and steel cable. 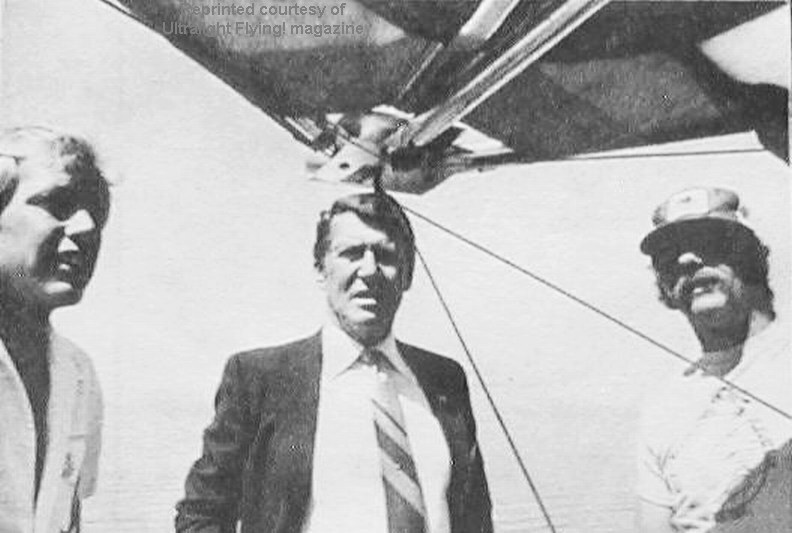 I do not recall a Don Murray, but I have not searched my Hang Gliding collection in detail for the early editors. Gil Dodgen took over from Rich Grigsby as editor from the January 1978 edition. It might be worth putting a request for info on the hang gliding forum HangGliding.org.